The job of Governor of the Bank of England is now being advertised. I a hoping that radical critics of the present elitist and destructive monetary regime will find a candidate we can rally behind. Between Occupy and the New Economics Foundation we should launch a shared platform for the favoured candidate. Alternatively we should send our individual cvs as radical economists, especially those of us who were able to see the crash coming before 2007 and warned accordingly. It has been disturbing over the past few years to witness how some of the most radical criticisms of government monetary and financial policy have been issuing from the Bank of England. I have been intrigued and encouraged to find that their staff have, in print and in person, shared much of my view of what has gone wrong, and sometimes what we should do to address these issues. When I ask why more radical policies, such as using QE to remove more of our debt from circulation or taking steps to bring about a managed default, are not being implemented the answer is that there is insufficient political pressure to fore the politicians to act. The reasons are political not technical. Let us contrast this supine acceptance of austerity and social dislocation with the situation in a country whose democracy we consider a mere fledgling compared to our own soaring eagle. In Tunisia the people are struggle to repudiate the debts taken on by the oppressive regime they overthrew in their Arab Awakening. They understand that without control of their financial system they can never have the freedom they crave. 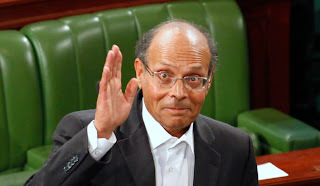 President Marzouki is demanding an audit of the debts taken on by the former regime as a first step to deciding which should be honoured, because they benefited the country, and those which only filled the foreign bank accounts of a kleptocrat and should therefore be repudiated. You can find links to videos where some of those leading the citizens audit campaigns describe what is happening in their countries. My presentation with Jonathan from Jubilee Debt Campaign on the UK is here. I presentation from Patrick about Tunisia is here. Those of us who support radical policies or vote for parties that do not get represented in parliament have long understood the image nature of democracy in the UK. But we have reached a situation now where the politicians are selling a line about our inability to pay for public servjces that should be open to debate, but in the UK in 2012 the 'three main parties' that is to say the three parties which the edia tells the people are available to receive votes, agree in the the financial conspiracy that services the 99% and sacrifices the rest of us on the altar of their greed, We have grown used to patronising the countries of the middle East with their 'awakening' from the slumber of tyranny. Isn't it time that we rather woke ourselves up and started using our democratic systems to reject the grossly unequal and exploitative nature of our current economic system?